Gov. Andrew Coumo is visiting Puerto Rico again. Gaby Acevedo reports. Gov. 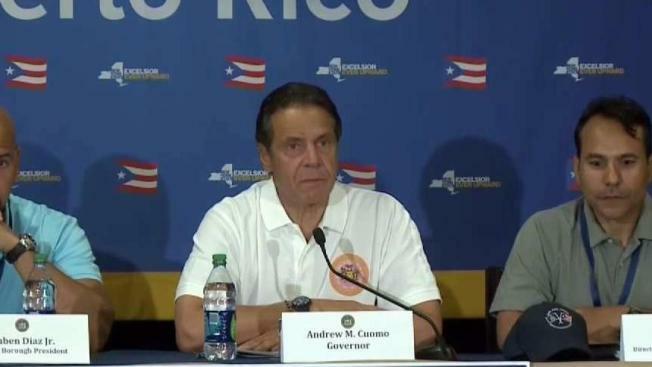 Andrew Cuomo says New York is providing another $2 million in aid to the thousands of Puerto Rico residents living in the state since being displaced by Hurricane Maria. The Democrat announced at a Manhattan news conference Wednesday that the funding will go to organizations providing services — inlcuding employment, housing, benefits counseling and health care — for about 11,000 residents of the U.S. territory who've arrived in New York since Maria devastated the Caribbean island last September. This investment is on top of the state's previous commitment of up to $11 million dollars in housing and workforce funding for displaced Puerto Ricans. Cuomo also reiterated his criticism of the disaster response by Republican President Donald Trump's administration. He repeated his earlier comment that the federal government's efforts were "an embarrassment for the nation." "Since day one, New York stood with our brothers and sisters from Puerto Rico, welcoming displaced families with open arms and will continue to do whatever it takes to help our fellow Americans get back on their feet," Cuomo said in a statement. Cuomo further added that the island's "plight was not caused by an act of God but by the federal government's failures. As New York acts, it's far past time that the federal government took responsibility for the consequences of its actions and begin to rectify the grave injustice committed against the people of Puerto Rico."